Injectables have long been utilized in an elementary fashion for the past 15-20 years to fill in lines and grooves. Unfortunately, most providers use fillers to “fill” the area under the skin, resulting in an irregular and unnatural appearance for the patient. Instead, I use fillers as lifters to lift your natural muscles up to the skin. I inject the fillers deep to the muscle to lift the muscle naturally. The fillers serve to support both the layers under the skin AND the muscle to enhance the natural convex contours of the face that are consistent with youth and beauty. In my opinion, hyaluronic acid products, such as Juvederm and Restylane, are the best fillers. They can be neutralized and reversed, should the need arise. Sculptra, Radiesse, and Autologous Fat Transfers, on the other hand, do not have the capacity to be neutralized or reversed. As the human face ages, fat molecules slowly begin to dissipate, and thereby become unable to support the skin and the muscles at a youthful convex contour. It is crucial for the provider to possess both a proper understanding of the anatomy of the face and a desire to create youthful contours in order to achieve outstanding results. There is beauty to be found in every human face. It is not the role of our science to gauge beauty against some arbitrary standard, but to utilize our tools to allow the various attributes of each face to work in concert. Consider the way a photographic image is made. Light falling on the subject is reflected from its contours and features through the lens of the camera. It is this reflected light that is photographed. I look at the face as if through a lens. The contours of a tired, wrinkly face do not reflect light in a harmonious, coherent way. I “adjust the light” until I am able to establish the youthful vectors in the face. The resulting “photograph” becomes my model. My work is to endow the face with qualities it never possessed and to bring out those qualities of beauty that are intrinsically its own. Just as aging is an ongoing process occurring in distinct stages, our effort to reestablish the youthful appearance must also be gradual. The rejuvenation is accomplished in several sessions, according to the needs of the individual and the degree of change that is sought. Facial Rejuvenation involves 4 necessary components. Just as a painter begins a portrait by selecting a palette appropriate to his subject, our work requires many different colors for its completion. Anti-Aging Facial Contouring Dermal fillers (including Juvederm, Restylane and Perlane) are staples that Dr. Kanodia uses to halt the march of time. Once again, any positive or negative results, including the length of time a filler lasts, lies in the skill of the person giving the injections. Whereas some physicians give up the job of injecting fillers to their nurses, Dr. Kanodia does the injections himself to make certain the filler is placed in the exact anatomical and aesthetic area to guarantee optimum and long-lasting results. The safest fillers are Hyaluronic Acid (H.A) based. These are injected not only to fill lines (i.e. Laugh lines and Marionette lines), but to reestablish and voluminize the youthful contour. The aging process begins due to the loss of padding beneath the skin (i.e. diminishing baby fat). In addition, elasticity and fullness are also compromised due to diminution in new collagen formation. The loss of padding and volume varies with the individual. Certain areas of the face evidence the loss of contour most dramatically. As padding diminishes, the skin in these areas flattens or sinks and the face begins to sag and wrinkle. Genetics, age and body weight are all factors in determining the amount of treatment required. It is very important that the product used is safe and biodegradable, and that its effect is reversible. With the right filler as a tool and a clear model in mind, Dr. Kanodia is able to work as an artist to voluminize the face and restore its youthful contour. Some rejuvenation is obvious after the first treatment, and so is the gratification it brings. Dr. Kanodia first numbs the area selected for treatment with a local anesthetic (ice may be used as well). A needle is then used to inject the filler substance beneath the skin. Total time spent for the treatment should be no longer than fifteen minutes. It’s quick and relatively painless. 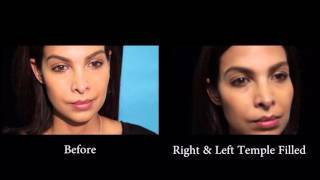 Dr. Kanodia personally does all Facial Contouring Filler injections for his patients. You will not be passed off to anyone else. He will personally consult with you and offer his expert eye for beauty and symmetry allowing you to get the very best from your Injection treatment.